Why Can't I Export Without a Tag Selected? 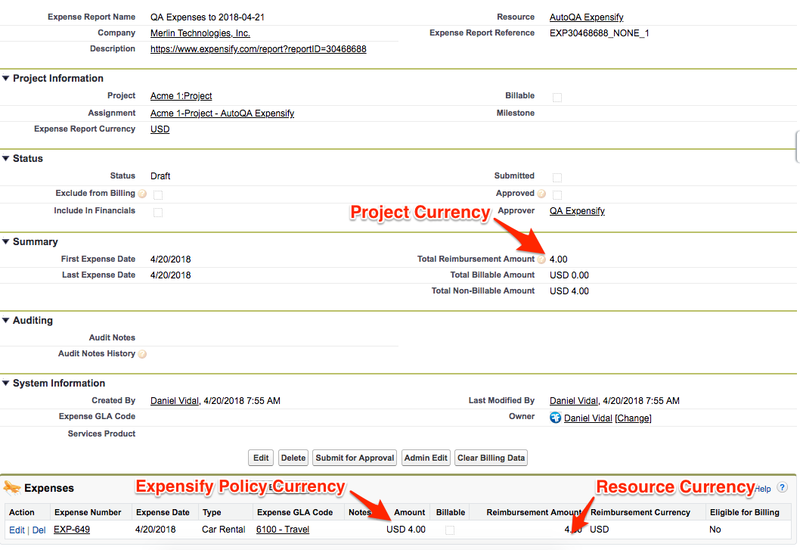 When exporting to FinancialForce PSA/SRP you may see up to three different currencies on the expense report. The currency in the summary is derived from the currency of the project selected on the expense. The Amount field on the expense line is derived from the Expensify policy currency. The reimbursable currency on the expense line is derived from the currency of the resource with an email matching the report submitter. Tax rates are created within Expensify under the Tax section of your policy. For more information on setting these up check out our Tax Tracking page. A. On the advanced tab of your configuration, you can select whether or not taxes will be billable. B. The amount calculated on the expense line in Expenify. C. The Tax Type is derived from your company in FinancialForce. To see the expense details in FinancialForce, just adjust your page layout to include Expensify Fields within your Expense Report or Payable Invoice. You will also want to do this on the expense detail page. To access this, click on the expense line item in the report or invoice. When receiving the error Please Update Your Expensify Bundle, you will need to update your Expensify bundle to include the new custom fields required for export. Update the Expensify bundle in SalesForce by clicking this link: Expensify Bundle. FinancialForce PSA/SRP requires a project be applied to each expense in order to create an expense report. Without the project tag, the export cannot be completed. Reports will export to FinancialForce PSA/SRP based upon the settings you have configured in the Connections area of the policy settings. This can be found by following Settings > Policies > Groups > [Policy Name] > Connections > Configure > Export page. You can learn more about how to configure this connection here.